This entry was posted on September 4, 2015 by Posturite. What you think about our products and services is especially important to us because they are primarily designed to help with health and wellbeing issues. We’ve joined forces with Feefo, so now you can tell us what products you love the most or if there are any areas of our service that we can improve. This way, you can help us make sure that we stay the best in the industry. 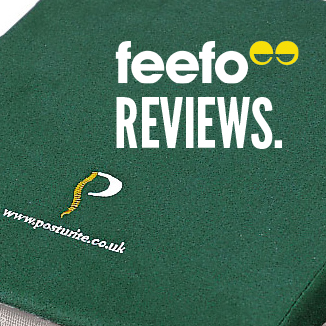 Our Posturite 11° wedge has had fantastic reviews. It can improve your comfort when sitting for a long time by encouraging you to adopt a more natural posture, which decreases muscle fatigue and pain across the lower back.